In close-knit societies, people are willing to help each other. I have found this to be especially true in rural settings. A perfect example of this happened in 1955 when my father was in his sophomore year at Texas Tech University. He grew up on a farm and was the first of his immediate family to go to college. It was that year when my grandfather passed away from unexpected heart trouble. It was very near to harvest time and my father knew he had no choice but to leave school and go back to the farm. As he drove up the road leading to the farm, he saw unfamiliar images surrounding their two-story house. As he arrived, he was greeted by 20 of their neighbor farmers and their tractors. These neighbors understood the immediate challenge facing my dad’s family, and through their sense of community, they worked alongside my father and harvested over 150 acres in one day. I have always remembered that inspiring experience my father shared with me. Today, in our fast paced information age, we don’t often hear of our lives affecting others in this way. We’ve alienated ourselves and tend to live in “little boxes” knowing little of our neighbors around us. Inside the box called home we watch other boxes we call TV sets and computer monitors. Seeing tragedy and bad news every day, we tend to become immune to suffering and need. It is easy to not even be aware of our neighbors hurts or needs. When we leave the box called home, we get into another box called an automobile and isolate ourselves once again as we speed through one neighborhood to another. Rushing through an unfamiliar neighborhood, we check to make sure that our box is secure by locking the doors. Arriving at work, we park our box next to all the others and walk briskly into yet another box, our office or work place. At night we simply reverse the process. Most days we move quickly from one box to another, feeling insecure and unsure when we are outside our normal confines. Bringing hope to our cities and under-served communities for most of us means we have to venture outside of our “boxes” in which we feel so familiar and secure. It is worth it… there are so many that are near & dear to the heart of God outside of our boxes. 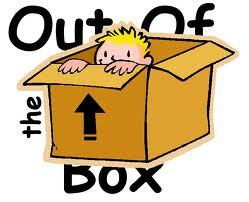 Let’s break out of these boxes and look for places and people who need compassion, hope and justice! Thanks to my friend Cori Leigh whom I affectionately call “sister-missionary” with the Across the Street Outreach for encouraging me to begin this blog!